GATE Energy is a family of companies that provide scalable, fit-for-purpose services for the energy sector including project management, engineering, commissioning, field services, operations and staffing services. GATE was dissatisfied with the level of service they were receiving and wanted to find a new vendor with a more personal touch. GATE was looking for a lighter-weight 10 x 10 booth that was easy to install that had a lot more pizazz than their current exhibit. GATE had just added a new company, Blue Fin, to their family of engineering companies and needed new graphics for them. When GATE Energy saw the 10’ backlit fabric graphic in Exhibit Network’s showroom, they were impressed. The exhibit had the pizazz they were looking for; it was lightweight and easy to install. GATE immediately disposed their old exhibit and purchased the model they saw in the showroom. 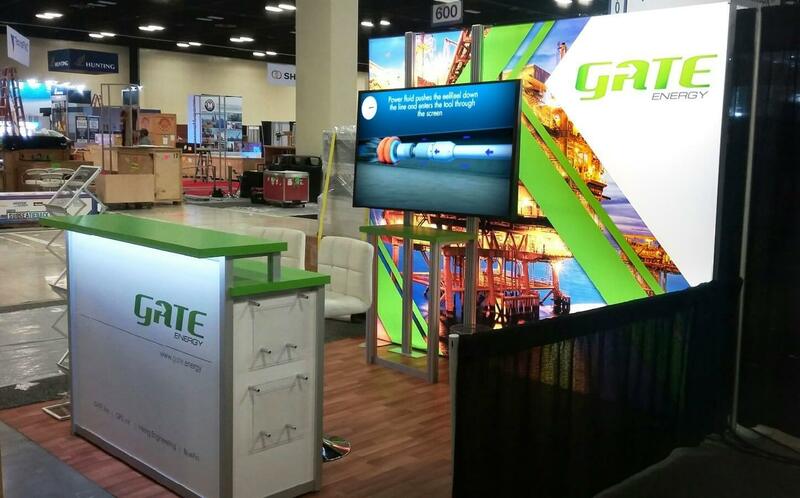 Later, GATE purchased an additional 10 x 10 custom exhibit with a closet to increase their exhibit to a 10 x 20. At one event, GATE rented matching exhibit properties from Exhibit Network for a 10 x 30 booth space. Additionally, Exhibit Network fabricated a custom greeting counter for GATE and produced a very well-organized and efficient crate for all the new exhibit properties and GATE’s furniture. GATE provides Exhibit Network with production-ready artwork for all its graphics, and Exhibit Network provides reliable turnkey services for all of GATE’s events.